I was a bit under the weather this weekend. It is tough to be sick when you have a child. It is even tougher to be sick when you have a child & are sharing a basement with that child, your hubby and a cattle dog while your house is in the final phases of construction. 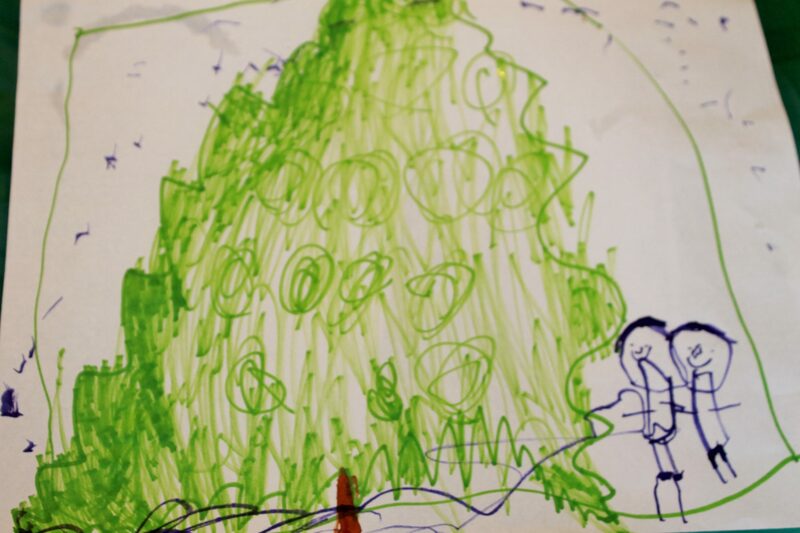 I spent a lot of time on the couch & trying to sleep and my daughter spent a lot of time drawing pictures with her friend that we were staying with. 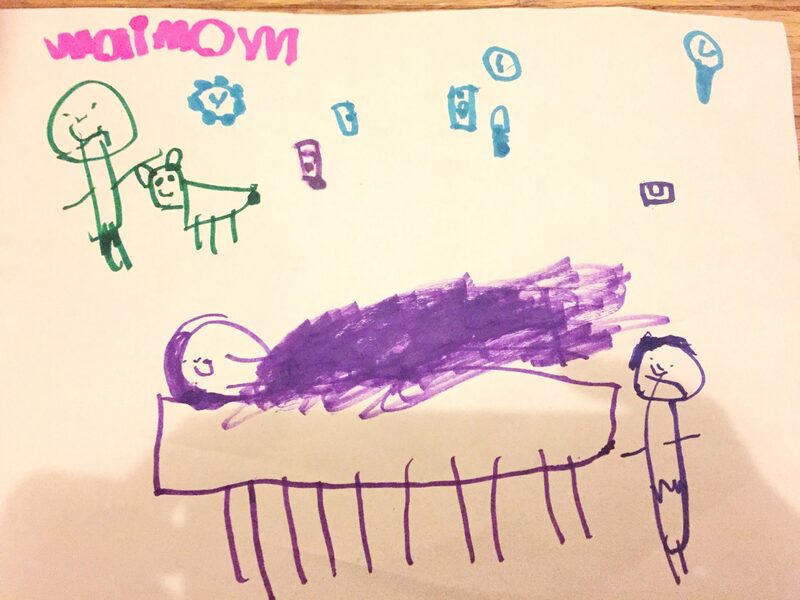 Here is a picture she drew for me while I was sick. There is me on the couch & my daughter next to me. The bald guy in the background is my husband with our dog. She drew me a bunch of get well cards & drawings. It was very sweet. Shewoke up yesterday & grabbed more paper & kept drawing. 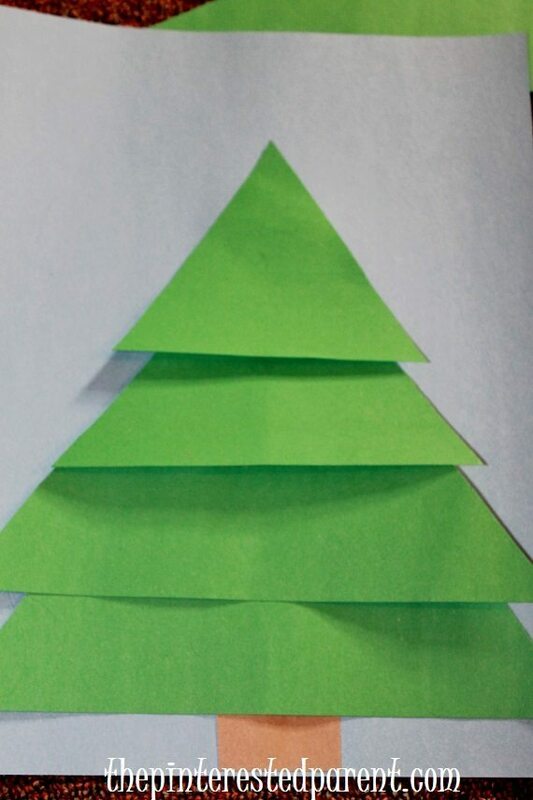 This time it was a Christmas tree. When she was finished, she was so very proud. 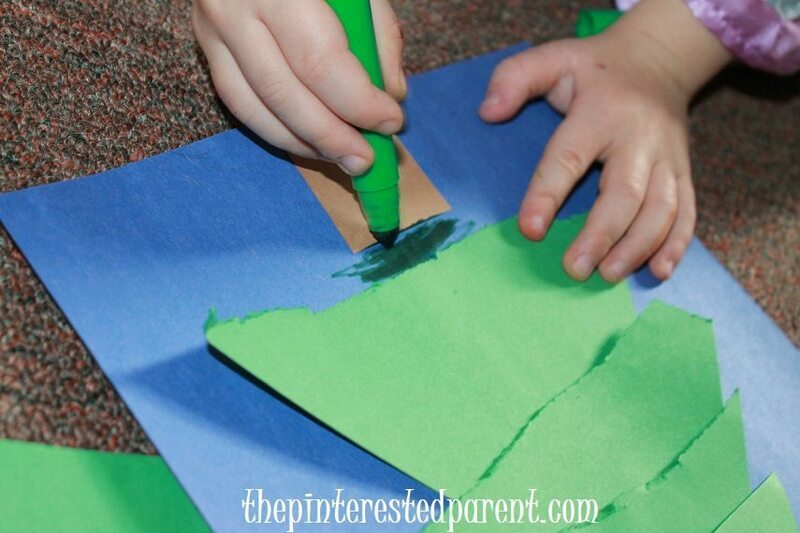 And just like in one of our latest crafts, she drew a little girl & boy and said they were looking out the window. So cute! She was so excited about her drawing. She wanted to hang it up. 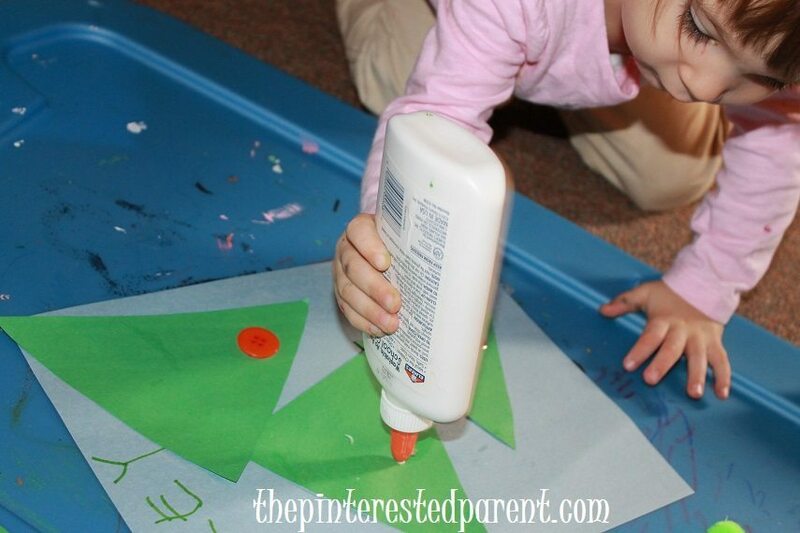 She then said to me “Let’s make more Christmas trees. I was still feeling a bit run down, but I have a hard time saying no to crafts. 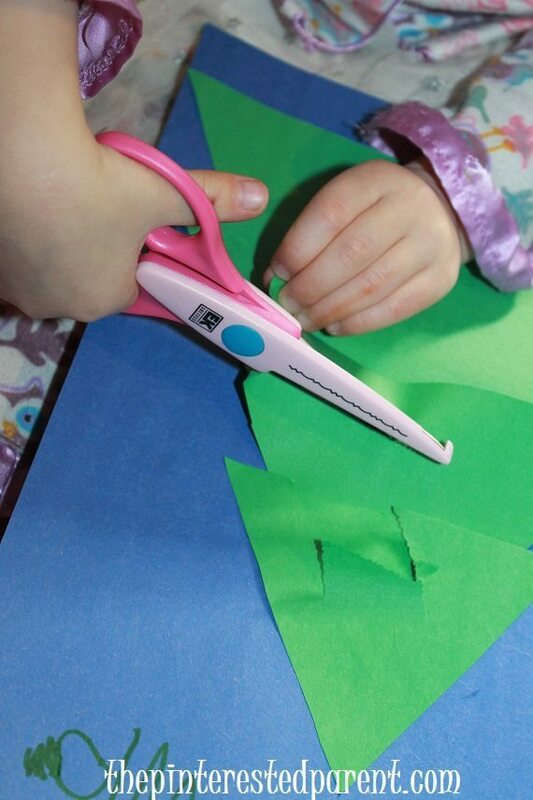 My daughter is big into using her safety scissors right now. She loves to cut up everything. I wanted to give her the chance to practice her cutting skills. 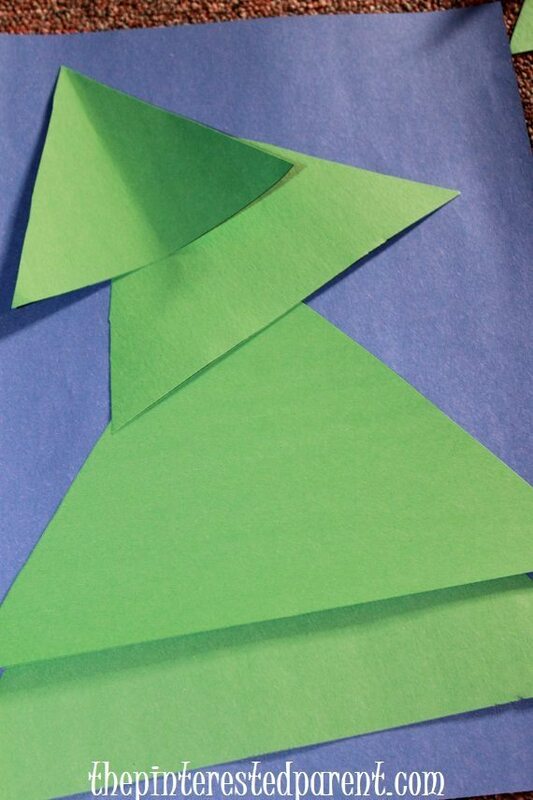 I cut 4 triangles of different sizes out of construction paper for each tree being made. 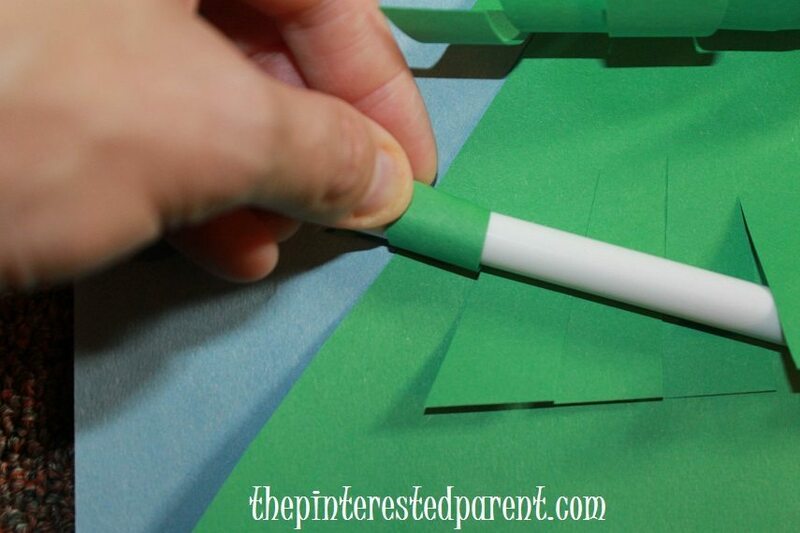 I glued the top 1/3 of the largest triangle & pressed it down onto the bottom of a piece of blue construction paper. 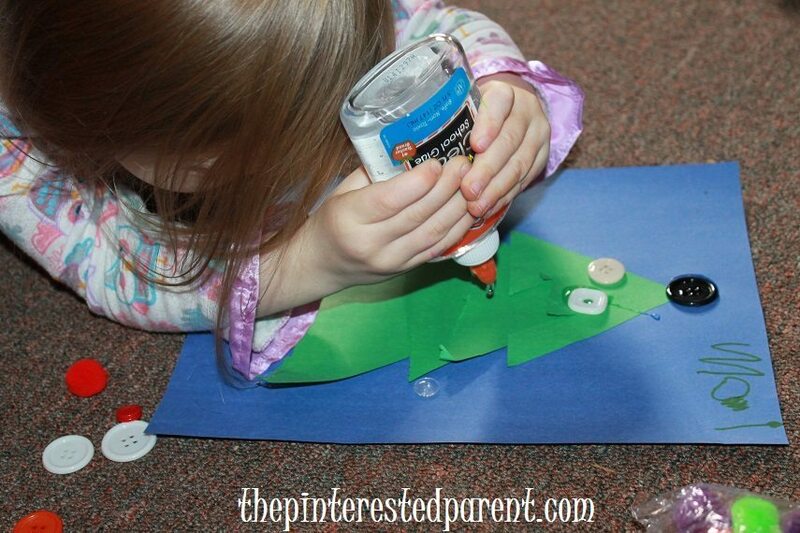 I glued the next biggest the same way over lapping the bottom triangle & continued this way with the rest. The bottoms of each triangle should be loose. 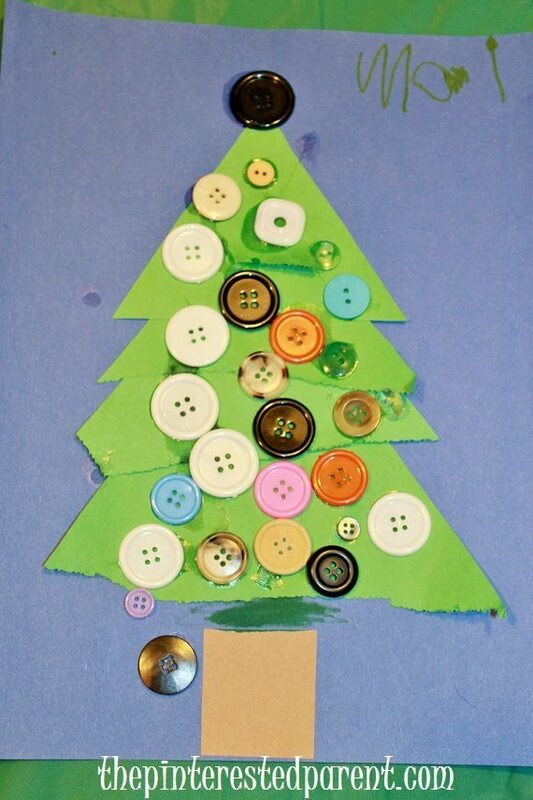 I had two different ages & skill levels doing this project. 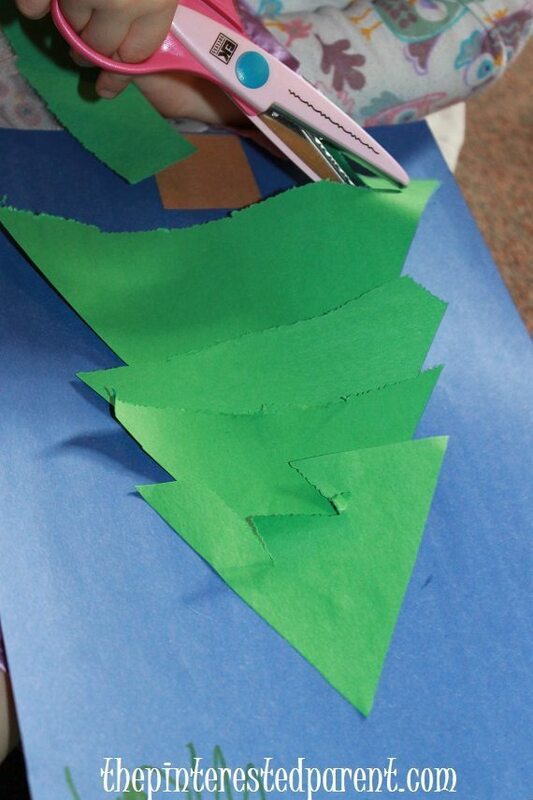 My daughter used the scissors, while her younger friend glued her own shapes down without the use of scissors. 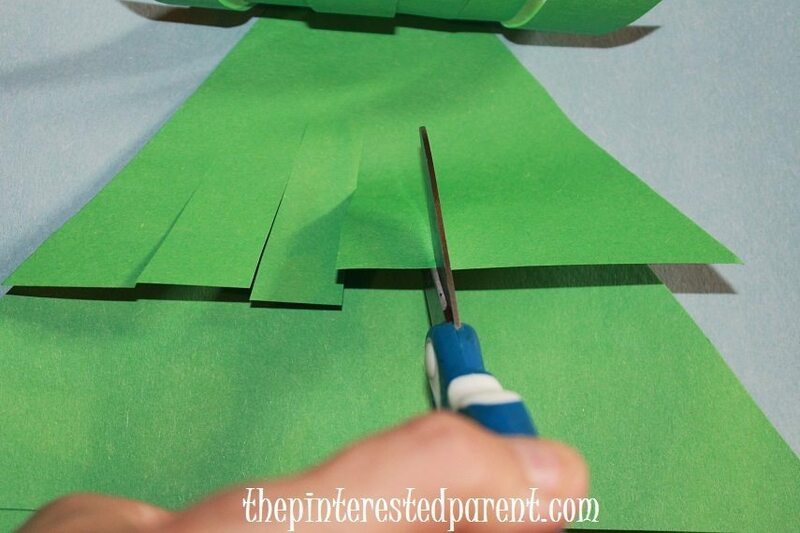 Use scissors & cut upward like shown on all triangle sections. Mai had her own method. She just want to cut. She trimmed & trimmed some more. When she cut the bottom tier & saw her trunk exposed, she cracked up & said “It looks like I went overboard.” I laughed. Where does she get this stuff? She used a marker to color in the gap. I used a marker to curl my cut sections upwards. 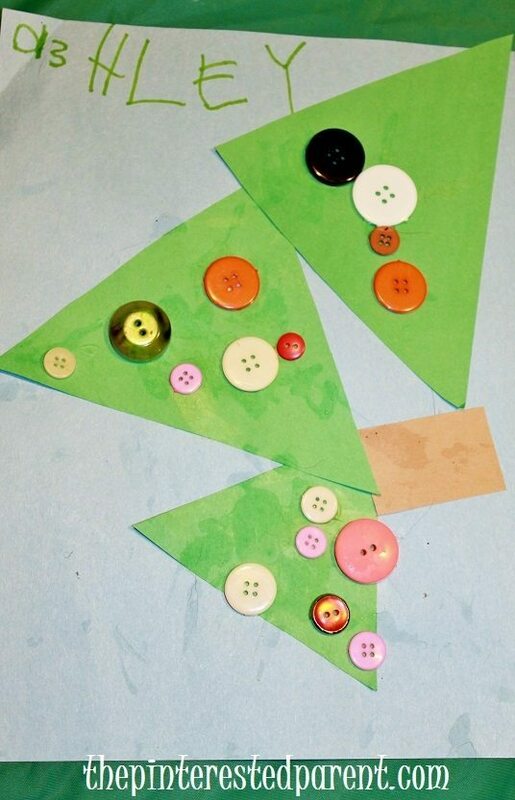 After we were done trimming our trees, we used buttons to decorate. Here are the girl’s finished products.